Are you caught up in a discombobulated network? Switching – Switches work by only sending the required data packets to the specific end users or devices, therefore cutting down on unnecessary data traffic on the network. 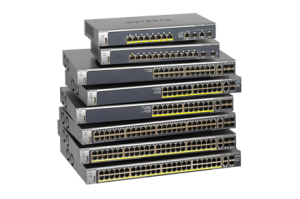 Modern switching is very advanced and is tailored specifically to the network and users requirements. In the modern world of IP telecommunications many installations will use switching that also delivers power(PoE) – Power over Ethernet to the end devices such as IP Phones, Security Cameras and Wireless Access points. 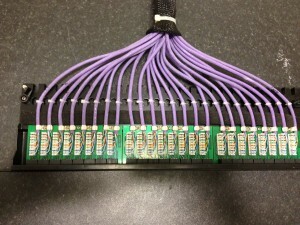 Data cabling – To deliver networks and phones to respective devices, copper cabling is laid with connectivity between patch panels, the wall or floor outlets. At NML we plan and install the structured cabling to a customers specifications and commonly install Cat5e and Cat6 Standards, as well as, pictured to the left Mauve LSZH. Often a requirement for the larger installations such as public areas (airports and other high density traffic) are Low Smoke Zero Halogen Cat5e cabling. Data Cabinets – House the patch panels which are the termination of all the data cables (Structured Cabling), these ports are then patched to the required device – Network Switches, Phone systems and other devices. Phone Systems – Are patched into the structured cabling and then connects the phone system to the desk positions. Servers – May host and control the printers on the network, contain your data, server files and host your website, control and manage the user access to the data and connect to the switch infrastructure to deliver the content and services to the network.